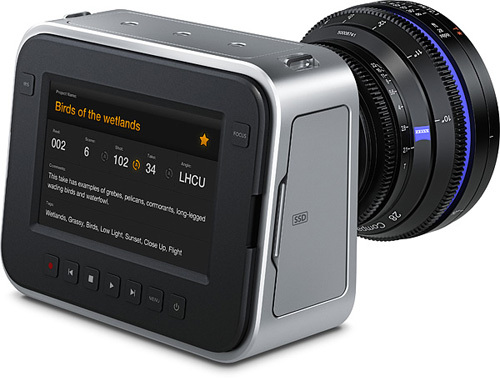 In a move that caught show attendees and, we presume, some top camera manufacturers by surprise, Blackmagic Design introduced their new Cinema Camera at NAB 2012. As with many of their other products, Blackmagic stayed true to its past course of upsetting the stuffy approach and high price schemes of the video industry. 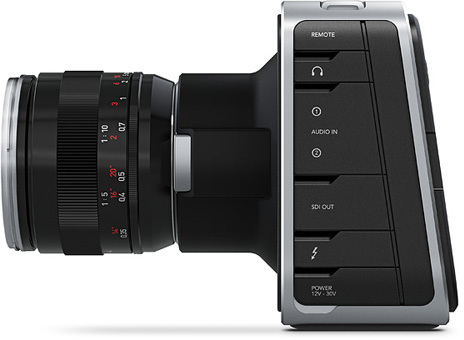 The uniquely-shaped Blackmagic Cinema Camera, not looking like any DSLR or camcorder you might have seen, has a sleek, clean design that follows the Australian company’s stylish design approach apparent in so many of their products. NYCPPNews’ Dan Ochiva, at NAB to cover the show, met with Dan May, president of Blackmagic Design U.S., to learn more about the potentially game changing entry of the company into the camera market. The sensor captures images at 2.5K via a near micro four-thirds sensor and offers a back panel touch screen for monitoring and control. It’s also the first camera anywhere to offer high-speed Intel Thunderbolt output, something other camera makers are sure to jump on for its 10Gb/s transfer rates. The Cinema Camera features a built in SSD recorder for capturing uncompressed CinemaDNG RAW 12-bit data, or ProRes or DNxHD formatted data which eat up less storage. These formats are common standards in today’s NLEs. To make this even more of a deal, the camera ships with a full copy of DaVinci Resolve color grading software (not the lite version). That’s a one thousand dollar value in itself. To start editing, simply pop the SSD out and stick it into a dock connected to your computer (for more information about recording to SSDs, check out my reviews of related Blackmagic gear, namely the HyperDeck Studio and the HyperDeck Shuttle. The camera accepts EF and ZF mount lenses from lens makers including Canon and Zeiss. Dynamic range, meanwhile, is an impressive 13 stops, which is almost the equivalent of film. We’ll be offering a review of the Blackmagic Cinema Camera as soon as they’re available in which we’ll be closely examining the image quality of the camera. Creating a camera of their own seems a logical move for Blackmagic who already creates products for acquistion and high end finishing. The more you learn about the Cinema Camera, the more interesting it gets. Aside from the innovative Thunderbolt port for capture and transport, the camera also includes SDI output, widely used in professional production and post industry. In addition The camera also comes with UltraScope, software that gives you technically accurate scopes on any computer connected by Thunderbolt. A large 5-inch touch screen on the back of the camera lets you monitor and play back your shots from the SSD using standard VTR-style transport control buttons below the screen. The screen itself, a capacitive touchscreen display, enables you to perform camera functions like focus, shutter angle, ISO as well as display information such as battery level and record time. It also allows you to enter in metadata, which is then stored in the file and is accessible via NLE software. There is also an optional handle grip to steady the camera when you’re shooting on the move. The camera will be shipping in July and has a $2,995 price tag. Dan Ochiva shot the video at NAB and contributed to this report.